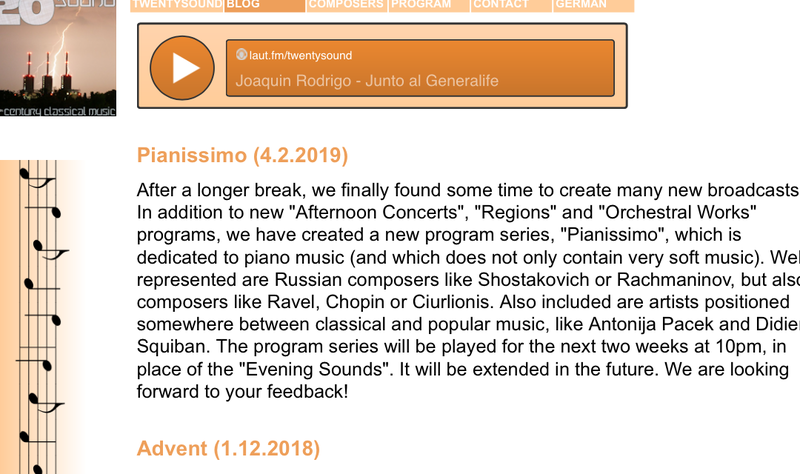 Twentysound radio in Berlin got partially inspired by my music to set up a new program, “Pianissimo”, dedicated to piano music only, as Mr. Schwarz wrote to me. Up to now, Twentysound radio did not have much focus on piano music, but on orchestrated compositions. As of this month, my music will be aired together with piano music from Shostakovich, Rachmaninov, Ravel, Chopin and Squiban. What a list! I feel deeply honoured and humble.